Learn the ways of the Force with Spin Master's LEGENDARY YODA interactive animatronic toy. 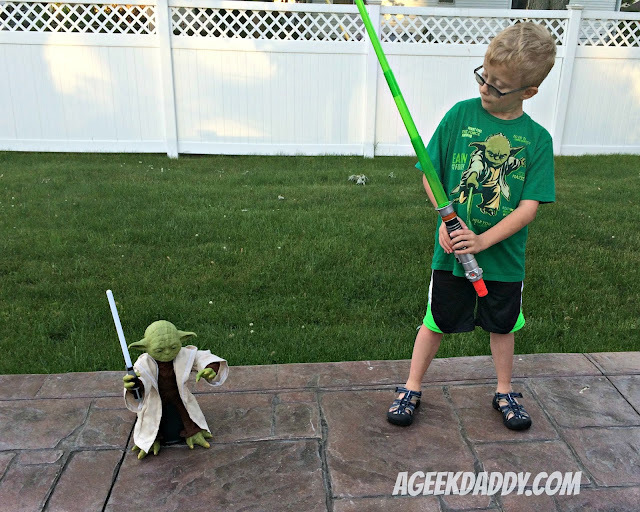 Experience being a padawan training to be a Jedi knight under the guidance of Master Yoda with this 16 inch high toy that is one of the most realistic Star Wars toys A Geek Daddy has ever seen. 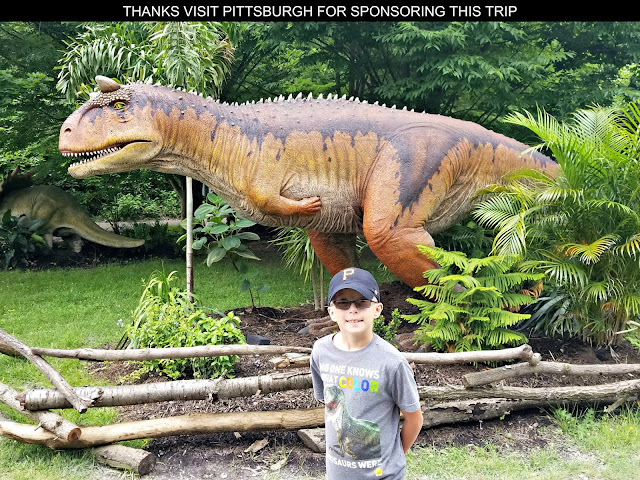 Our family has enjoyed hours of fun playing with Legendary Yoda as he demonstrates light saber dueling skills, imparts Jedi wisdom and teaches you how to use the Force. We've enjoyed practicing handling a light saber on our back deck with Legendary Yoda on multiple occasions and the toy has worked really well though the instructions very clearly state "not for outdoor use." I believe this warning is primarily for two reasons. First, the toy is powered by 7 motors that provide for it to operate with an incredible 360 degree level of motion and there is the risk that water, dust and other outdoor elements could damage these mechanics. Secondly, sunlight hinders your ability to see Yoda's light saber illuminate which takes away from the play experience when using the toy outdoors. Though I do have to say it is still fun to play with outside! As you can see indoors, Legendary Yoda's light saber is clearly visible as he engages into Warrior Mode. Equipped with his signature green light saber, Legendary Yoda will share with you advanced techniques any Jedi will need to know in order to defeat an evil Sith opponent. He also shares some of his Jedi Master humor with padawans. Don't despair from Yoda's mocking as with continued patience and practice he will provide you with the wisdom of a Jedi. Legendary Yoda's Wisdom Mode provides voice recognition to six key phrases allowing any Jedi want-to-be to converse with the toy and trigger a variety of mechanical actions. In Wisdom Mode, Yoda will utilize the Force to answer any Yes or No Question you may pose to him. Yoda is programmed with more than 100 phrases to keep his banter from being too repetitious during continuous use. Just like Santa Claus knows if you have been bad or good so does Yoda with his built-in Dark Side sensor that becomes activated during Wisdom Mode. Spin Master has also included a walking stick accessory that can be switched out with Yoda's light saber to provide a scholarly appearance for the Jedi Master while engaging in Wisdom Mode. Once you've experienced Warrior Mode and Wisdom Mode, utilize the toy's Force Mode to use this mystical power for yourself. Legendary Yoda really moves when you use the Force to control pushing him back across a room. Who hasn't wanted to mimic using the Force from a Star Wars movie scene in real life?! Legendary Yoda gives you that chance, but beware if you see his hand light up because he may respond against you with his own glowing "force blast." The toy requires 6 C batteries to operate and doesn't utilize its own rechargeable plug-in battery which is a bit of a drawback as I hate buying and replacing batteries for toys; but it does provide a lengthy amount of play time with the 6 C batteries as our family has played with the toy for several days without having to replace them. Just be prepared to have to buy batteries for this toy as they are not included. Legendary Yoda's motion works well on flat surfaces such as cement, tile and hardwood floors and thin carpet but avoid shaggy rugs which will hinder its wheels not allowing it to move or spin. 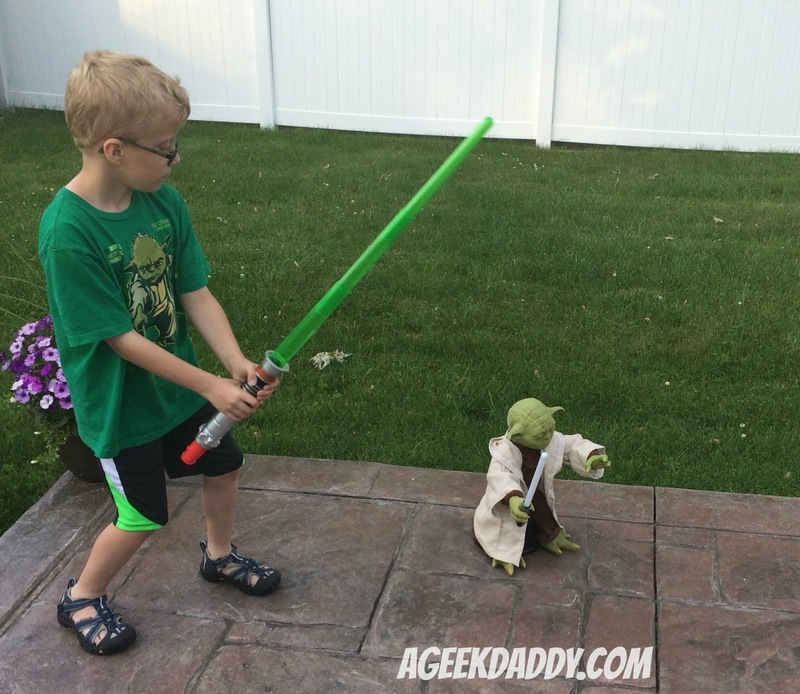 Legendary Yoda has earned A Geek Daddy nod of approval because it is a dynamic toy that has provided our family with a tremendous amount of enjoyment playing with it. The interactivity, iconic phrases, and mechanical motions that are incorporated together to bring Yoda to life truly makes this a wonderful toy to play with. 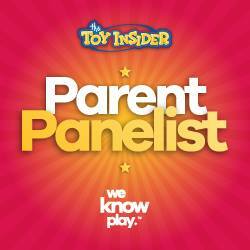 Any Star Wars fan, no matter if they are young or old, will enjoy playing with Legendary Yoda from Spin Master Toys. Are you ready for Legendary Yoda to teach you in the ways of the Force? Legendary Yoda is available from Toys R Us and can also be purchased directly from Spin Master Toys. Legendary Yoda is recommended for Jedi 6 years old and up.